No margin for aiming error. No need to look at your level . Shoot with consistent accuracy shot after shot from any angle or position. Every time you draw your bow, your top pin will be sitting between the alignment dots. You will not see all your pins at one time. The top of the bow rocks rearward accomplishing the same as moving your bow arm. The pin for the distance you’re shooting will be sitting between the alignment dots. No low-light shooting conditions without the optional light when hunting from a tree stand. Optional light is for ground blind hunters or where night hunting is legal. For the first time ever, shoot a right hand bow and aim with your left eye or visa-versa. 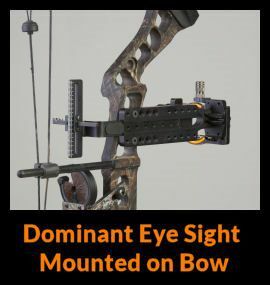 Functions with any front sight of your choice: Multiple pins, single fixed pin, single adjustable pin and the pendulum. 30 DAY MONEY BACK GUARANTEE EXCLUDING SHIPPING.